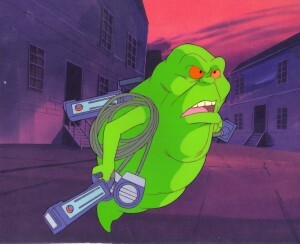 Slimer is a Class 5 Full Roaming Vapor that was the first ghost ever caught by the Ghostbusters. He slimed Peter during that meeting, and Venkman nurses a bit of a grudge over it for a long time. Slimer, on the other hand, considers Peter his favorite human being in the whole world, and is always trying to get on his good side. Slimer's primary motivation is eating, and one of the things Peter often gripes about is the massive food bill Slimer runs up. Slimer starts the series as a babbling, somewhat cowardly figure, but later on talks more coherently and basically acts as "fifth Ghostbuster" (developments not embraced by much of fandom). He has a number of adventures in his own "Slimer!" cartoons, which mostly involved avoiding quack scientist Professor Norman Dweeb, or having comic misadventures at the Hotel Sedgewick, his old haunting grounds. 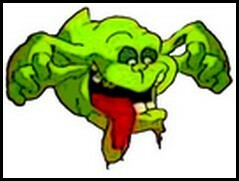 Slimer is still hanging around the firehouse, and appears frequently. He is portrayed closer to the earlier days of RGB, as a babbling, gluttonous pet. He also seems to annoy Eduardo, in an echo of Slimer's combative relationship with Venkman.